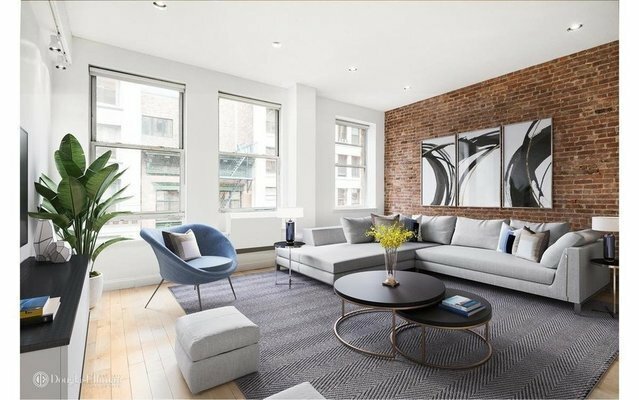 Located in the incomparable Gold Coast of Greenwich Village on one of New York City's most beautiful streets, this 2 bed 2 bath loft is immersed in warm, direct southern light. Open concept apartment features soaring 11 foot ceilings, exposed brick, oversized windows, hardwood floors and a large private terrace accessible from the master bedroom. Ideal for entertaining, this large and open home has a fully open chef's kitchen with stainless steel appliances, corian counters and room for a kitchen island. A washer dryer may be installed in the apartment with board approval. Enjoy the quaint and eclectic air of Greenwich Village's tree lined streets, historic townhomes, Michelin Star restaurants, nightlife and shopping. Ideal central location is close to iconic Washington Square Park, Union Square, Astor Place, Whole Foods Trader Joe's, Union Square Farmer's Market and access to the 4, 5, 6, N, Q, R and L trains. This immaculate building has a fully renovated lobby, laundry room and video intercom system. Well established co-operative allows 80% financing, guarantors, parental purchasing for working or graduate children, gifting and pied a terres case by case with board approval. Subletting with board approval is permitted after 2 years of ownership, for 2 of 4 years. Pet friendly building, too. Please note these are virtually staged images.